WASHINGTON — Students with disabilities deserve access to higher education to achieve their dreams and goals like everyone else. That is the message several panelists delivered Thursday at a session on the Improving Access to Higher Education Act. 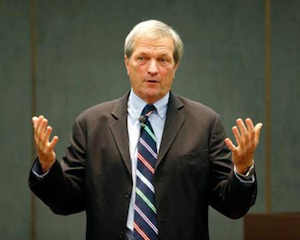 As part of the House Education and Workforce Committee Democrats’ “Aim Higher” initiative, U.S. Rep. Mark DeSaulnier (D-Calif.) and ranking member on the committee, Bobby Scott (D-Va.), worked together in developing the Improving Access to Higher Education Act, presented as the first comprehensive legislation that specifically focuses on the needs of disabled students in higher education. The bill that was introduced on Wednesday would amend the Higher Education Act (HEA) to improve access for students with disabilities after completing high school. Experts say the implementation of the Individuals with Disabilities Education Act has proven beneficial for students in K-12, but disabled students in higher education have not had as much support. Disabled panelist Daniel Castellanos, a 2016 graduate of Millersville University in Millersville, Pennsylvania, went through Millersville’s post-high school Integrated Studies initiative that caters to young adults with an intellectual disability (ID). “Once you enter the class this is not like any special ed class. You’re in a regular class with the regular students, it’s a lot more opportunity and a lot more experience to make new friends outside of class and inside of class,” said Castellanos. Panelist James Cassidy is participating in a similar program called Turning Point at Bergen Community college in Paramus, N.J. “I wanted to go to college so I can try a new challenge for a change,” he said. “Students with ID want the opportunity to go to college like their siblings and friends to learn and experience independence and gain employment after graduation,” said Stephanie Smith Lee, senior policy advisor for the National Down Syndrome Congress. The Improving Access to Higher Education Act addresses many needs for students with disabilities including training faculty members to deliver accessible instruction. The bill would provide grants to institutions of higher education to train their faculty members on methods, accommodations, career pathway guidance and more to assists students with disabilities. Jacqueline Rodriguez is an assistant professor of special education at William & Mary School of Education in Williamsburg, Virginia. Rodriguez emphasized the importance of ensuring that teachers are properly trained to teach students with disabilities. “Our focus must go beyond the question of who should be receiving a postsecondary education. We must aim higher and focus on how every student should be receiving a postsecondary education,” Rodriguez said. The bill also includes a requirement that all higher education institutions have an office of accessibility that will create and implement policies that support students with disabilities. Other needs that the bill addresses include increasing accessibility to instructional materials and technologies; expanding higher education options for students with disabilities; improving data collection and closed captioning training; and developing a university-wide universal design for learning. According to the American Institutes for Research, in 2005, 46 percent of students with disabilities who graduated from high school enrolled in a postsecondary institution, and only 40 percent of those individuals completed their degrees or certificates within eight years. Disabled students who enroll in four-year institutions are attaining their degrees at a 34-percent rate. “Postsecondary opportunities for students with ID offer a new path to academic access, social inclusion and working and living as independently as possible in the community,” Smith Lee said. Panelists emphasized that students with disabilities are not included when discussing the importance of opportunities for individuals. DeSaulnier reminded the audience of historic people who struggled with disabilities but through education they achieved their dreams. “We should remember that Albert Einstein, George Washington, Lord Byron . . . many have had to deal with disabilities as we learn more about it so how we all benefit is by opening and helping institutions… so that many people in society can benefit from disabled people,” said DeSaulnier. “This is an opportunity for anybody with disabilities that they can do what people always tell them they couldn’t do … this is what the heart desires, this a chance of a lifetime.” said Castellanos. You may contact Ya-Marie Sesay by e-mail at ysesay@diverseeducation.com or follow her on twitter @Sesayyamarie.